Bobby Owsinski recently posted an article on his site about drum EQ points. Here's a snippet of that article that includes frequencies for individual drums. Beware that boosting from 40 to 60Hz too much may make the kick sound big on your speakers, but it might not be heard when played back on smaller speakers. 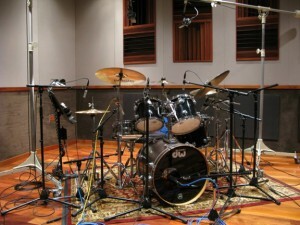 Also remember that the ideal spot for a 22 inch kick drum (which is the most commonly used) is around 80Hz. Btw, check out other items in our Engineer's Notebook category. There are plenty of tips on recording, mixing and mastering to name a few subjects.